My name is John Burbank. I am the Executive Director of the Economic Opportunity Institute and a member of the Compensation Task Force on Early Learning that the Legislature established two years ago. I would like to thank the House sponsors of HB 1344 for their foresight in addressing the foundations for high quality and affordable child care in our state. While the state has focused on and funded the supervisory structure of the Quality Rating System and Early Achievers, it has done very little to address affordability and compensation. As we all recognize, current compensation for child care teachers creates a pathway into poverty, not out of it. The median wage for child care teachers is $14.23 an hour. At full-time work, that comes out to less than $30,000 a year. Over the past eight years, teachers’ wages have increased 5 cents per hour per year. Teachers are now compensated at $10 less per hour than the median wage. That’s an indication, beyond rhetoric, of how we value the learning and care of our youngest children. We don’t. A compounding problem for child care centers and family home providers is the deficit that the state actually creates in its subsidies for child care for low-income children. 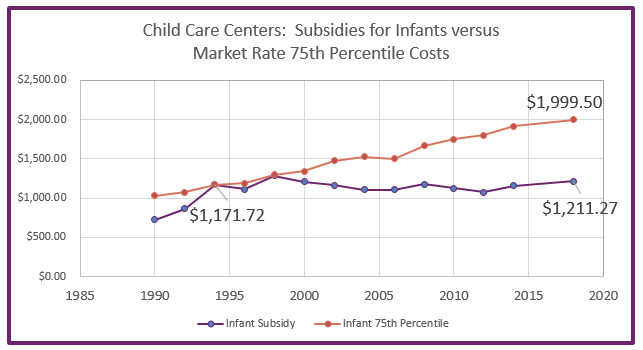 Our subsidy system reimburses centers for infant care at $1,200 a month, about $800 a month less than the federal standard for reimbursement. 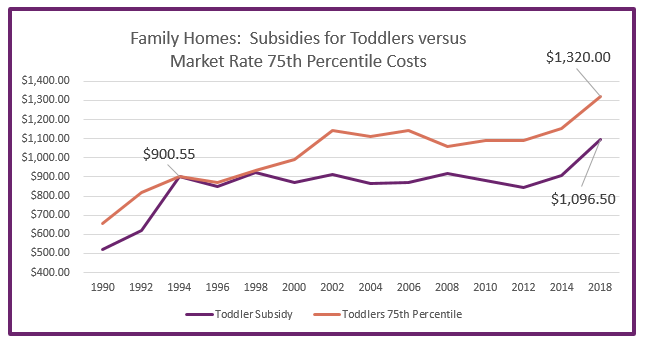 For toddlers in family homes, the subsidy gap is $300 a month. Fund the collective bargaining agreement with SEIU 925 for family home providers. Eliminate the co-pays for child care subsidies, and fund this increment with state funds. Extend the subsidy ladder from $41,000 to $51,000 for a family of three. Fund wage increments through the state law, RCW 216.675 that the Legislature passed in 2005, partially funded through 2011, and then seemed to have forgotten. We recommend a $40 million line item in the 2019-21 biennium budget, to fund $2 an hour education wage increments for 4,800 child care workers and teachers. This would cover two-fifths of the entire early childhood education workforce in Washington. These steps will put us on the pathway toward decent compensation and affordability, while the task force considers how to universalize high quality child care for all. As to funding, I am happy to discuss several new progressive funding options which the Legislature could consider as dedications to early learning and child care.